Most of our biggest health issues don’t have easy fixes. 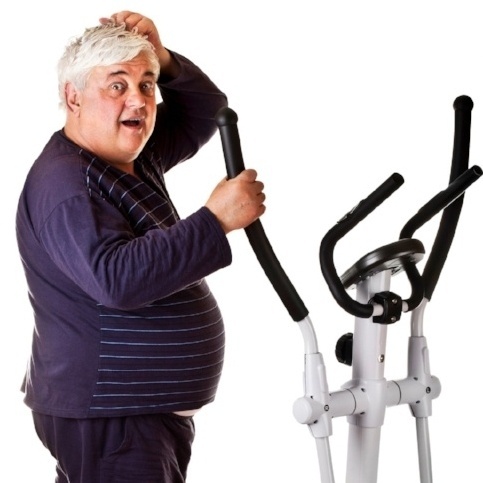 You don’t lose that extra 50 pounds just by setting foot into a gym. Your cholesterol doesn’t drop from 240 to 160 after skipping one steak. 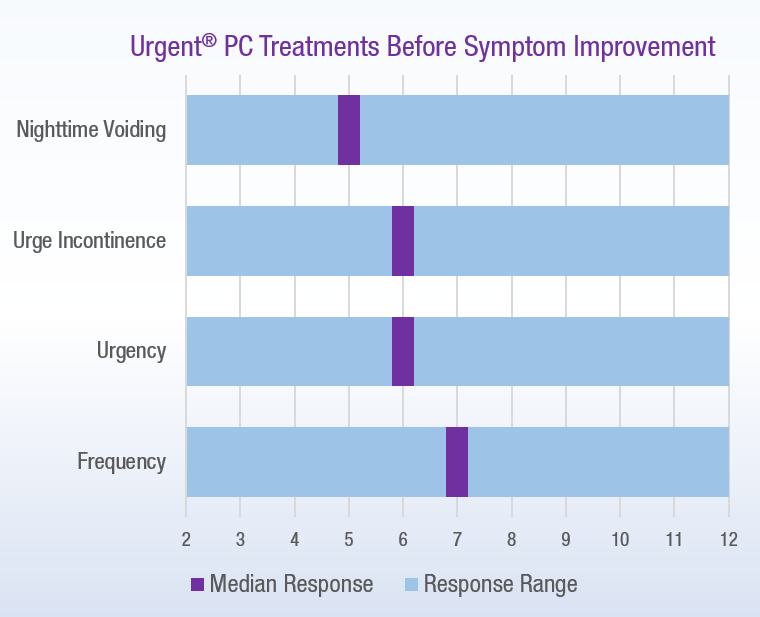 Likewise, for overactive bladder patients receiving Urgent® PC treatments, it can take time to see the results. However, the reality is that up to 80% of patients achieve substantial improvements with Urgent PC therapy. It just takes time and for some patients it’s longer than others. While MOST patients start to see substantial improvement midway through the initial 12 percutaneous tibial nerve (PTNS) treatments, some respond much earlier and some respond much later. In a retrospective review of 141 patients at a single site, successful patients responded anywhere between 2 and 12 weeks. Within this group, nighttime voiding was the first to improve, with the median of patients seeing an improvement by 5 weeks. The symptoms of urge incontinence and urgency improved by week 6 with improvements in frequency typically seen by week 7. This same review demonstrated that, for some successful patients, improvement in some symptoms did not occur until after 8 treatments. 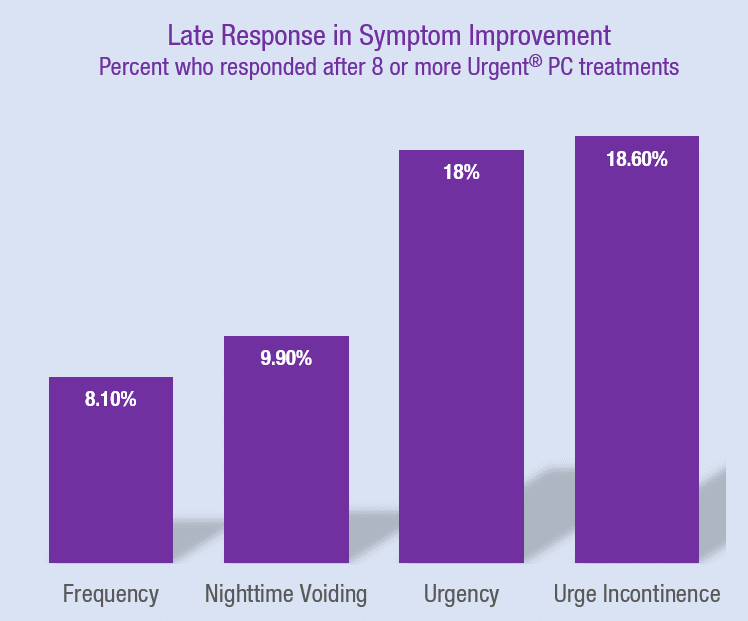 For example, nearly 20% of successful patients only noticed substantial improvements in their urge incontinence after they received between 8 and 12 Urgent PC treatments. While most patients won’t begin to see the full extent of their improvement until at least halfway through the treatment, that doesn’t mean that there won’t be iterative changes before then. Our PTNS bloggers note that it’s important to use voiding diaries so that both the practitioner and the patient are aware of and can celebrate even the smallest successes. Even if it’s been 6 or 7 treatments and your patient has yet to achieve a noticeable improvement in any or all of their symptoms, encourage them to hang in there. Let them know that there’s still a sizable chance that they’ll respond by week 12. For more information about topics such as preparing your patient for PTNS and managing expectations, view the posts written by our PTNS bloggers. Urgent PC is indicated for the treatment of Overactive Bladder and associated symptoms of urinary urgency, urinary frequency and urge incontinence. Treatment with Urgent PC is contraindicated for patients with pacemakers or implantable defibrillators, patients prone to excessive bleeding, patients with nerve damage that could impact either percutaneous tibial nerve or pelvic floor function or patients who are pregnant or planning to become pregnant during the duration of the treatment. Most patients don't experience side-effects. If side-effects occur, they are typically temporary and include mild pain and skin inflammation at or near the stimulation site. Caution: Federal law (USA) restricts this device to sale by or on the order of a physician. For complete instructions for use, storage, warnings, indications, contraindications, precautions, adverse reactions and disclaimer of warranties, please refer to the insert accompanying each product or online at www.cogentixmedical.com. Urgent is a registered trademark. © 2016 Cogentix Medical. All rights reserved.